"The perfect place for your child to learn to sail"
Please print and mail check and registration form to the address provided on the form. The sailing camp program is designed for children from 8 to 17 years of age. The children are grouped according to age, and experience. Sailors are placed in single- and double-handed boats for lots of on-the-water learning experience. The goal of the course is to develop an appreciation for sailing through rigorous FUN! The camp, for beginners to advanced sailors, is designed to teach basic sailing techniques and water safety for the beginners and lead into racing and higher level techniqures for the more advanced. 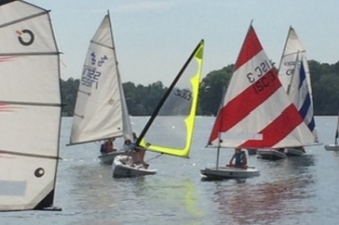 The Club currently sails Prams, O'Pen BICS, Sunfish, Lasers and 420's for our aspiring sailors. The purpose of the program is to develop in each child an appreciation for and love of sailing. We are currently expecting to run six one-week basic & advanced training courses. 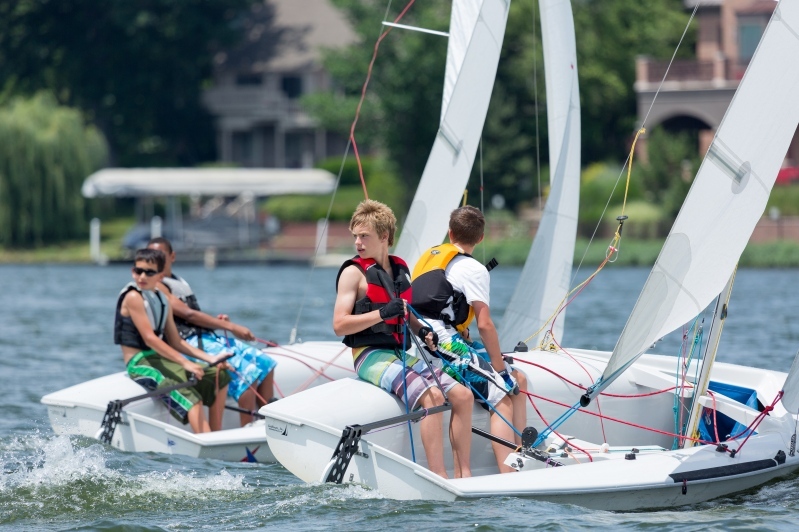 Our highly trained staff uses the US Sailing instructional system in an open learning environment. Classes begins with land-based discussions and demonstrations followed by on-the-water instruction where skills like upwind sailing, downwind sailing, reaching and docking are covered. Additional activities like swimming, weather awareness, knot tying & on/off water related games are interspersed throughout the day to keep the action going and provide a fun group experience. As the class progresses, instructors may even begin some introduction to racing if kids show interest. We recommend 2 or more sessions for those who really want to improve their sailing skills. Signing up for multiple sessions is a great way to get your sailor to more advanced levels of sailing. Note: All dates are subject to change due to wind & weather. We will do our best to inform participants ahead of time. Sailors must be comfortable rigging & sailing their own boat. Sailors must be comfortable rigging & sailing boats. July 6th - 12:00pm until 4/4:30 depending on wind & weather. Students must bring their own lunches as well as a lifejacket, water bottle, change of clothes, shoes that can get wet, sun protection, and towel.